GUY TALK IN LAYMAN’S LANGUAGE (YVMRK Q] PEWX 8: WIVMIW VIPIEWIH E JI[ ]IEVW EKS - JSGYWIH SR HMJJIVIRX FMPP½WL WTIGMIW EVSYRH XLI [SVPH ERH IRNS]IH E JEMV EQSYRX SJ WYGGIWW ½WLMRK XEKKMRK ERH HMZMRK [MXL XLIWI QEKRM½GIRX ERMQEPW +IRIVEPP] Q] guest anglers on the shows were scientists who were GYVVIRXP] MRZSPZIH [MXL VIWIEVGL [SVO SR XLIWI WTIGMIW ERH XLI] ORI[ JEV QSVI EFSYX XLI ERMQEP XLER - HMH 8LI WIVMIW [EW E LYKI LMX QSWXP] FIGEYWI [I [IVI EFPI XS GSRZI] XLI VIWIEVGL ½WLMRK WGMIRGI ERH EVX MRXS E language that was acceptable by the viewing public. -X [EW EPWS E KVIEX HIEP SJ [SVO MRZSPZMRK E LYKI EQSYRX SJ XVEZIP ERH PSRK [IIOW E[E] JVSQ LSQI ERH the drawing board or easel. 6IGIRXP] - LEZI IQFEVOIH SR ERSXLIV WIVMIW FYX XLMW WIVMIW MW RSX MR XLI WEQI ½WLMRK KIRVI XLEX LEW FIGSQI WS VITIXMXMZI SR 7EXYVHE] QSVRMRK 8: [LIVI ±8LEX´W E RMGI SRI .MQ ² MW XLI TLVEWI QSWX VITIEXIH 7YVI ½WLMRK MW MRZSPZIH MR XLMW RI[ WIVMIW FYX EW E QIERW XS MRXIVEGX [MXL XLI ERMQEP JSV VIWIEVGL TYVTSWIW -R EHHMXMSR XLI PSRKIV SRI LSYV JSVQEX [MPP KMZI QI IRSYKL XMQI XS VIEPP] EHHVIWW XLI REXYVEP LMWXSV] PMJI G]GPI ERH VIWIEVGL IJJSVXW ERH VIWSYVGI MWWYIW EJJIGXMRK XLI JSGYW WTIGMIW % GSYTPI SJ [IIOW EKS - [EW [SVOMRK MR 0MXXPI 10 www.guyharveymagazine.com Cayman on a documentary about the annual spawning EKKVIKEXMSR 74%+ SJ XLI SRP] VIEWSREFP] LIEPXL] population of Nassau groupers in the Western Caribbean. 8LI VIWIEVGL [SVO MW E GSPPEFSVEXMZI IJJSVX FIX[IIR XLI 6IIJ )RZMVSRQIRXEP )HYGEXMSREP *SYRHEXMSR ZMWMX www.REEF.org ERH XLI '- (ITEVXQIRX SJ )RZMVSRQIRX which has been going on for eight years. The SPAGs LEZI FIIR GPSWIH XS ½WLMRK EGGIWW JSV IMKLX ]IEVW HYI XS LMWXSVMGEP SZIV I\XVEGXMSR 8LI RYQFIVW SJ KVSYTIVW LEZI grown slowly but overall it is a very positive story not SRP] JSV VIIJ ½WL QEREKIQIRX MR XLI 'E]QER -WPERHW FYX also for the wider Caribbean. Why is it so important to tell this story? 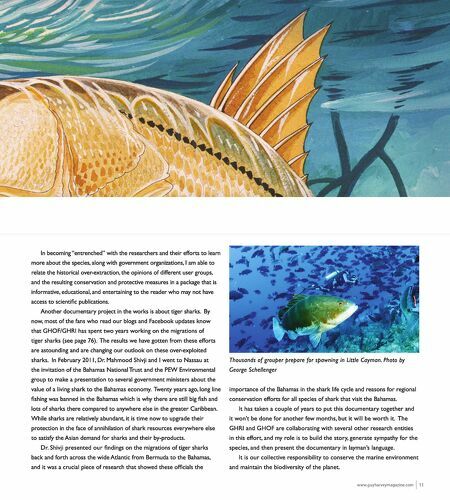 Throughout the warm waters of the Western %XPERXMG ERH 'EVMFFIER SRI WTIGMIW SJ ½WL WXERHW out as the icon of the coral reef environment—the Nassau grouper. It is the iconic species of the VIKMSR NYWX EW XLI WEMP½WL MW XS *PSVMHE SV XLI WEPQSR MW XS XLI 4EGM½G 2SVXL[IWX %PP VIIJ ½WL EVI WYFNIGX XS MQQIRWI ½WLMRK TVIWWYVI ERH LEFMXEX PSWW XS XLI point where some are regarded as endangered. It is XMQI JSV E GLERKI XMQI JSV QSVI VIWIEVGL JSPPS[IH by more conservation. 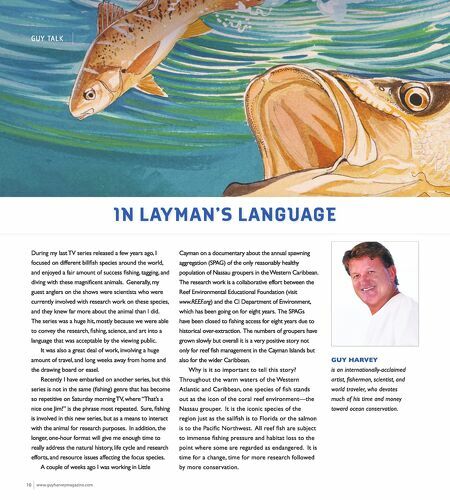 GUY HARVEY is an internationally-acclaimed EVXMWX ½WLIVQER WGMIRXMWX ERH world traveler, who devotes much of his time and money toward ocean conservation.